We woke up rather late considering today was the day we had been working towards for nearly five months. We took our time packing up – I visited the privy twice. We were on our way to summit Katahdin at 7:00am – the other hikers we saw tenting last night were nowhere in sight. We passed the ranger station and started heading up the trail, signing in at a trail register along the way. The trail started easy enough, passing crystal clear streams and beautiful waterfalls on the way up. We emerged above treeline at 9:45am – we had been gaining serious elevation all morning. There was a lot of hand-over-hand climbing. As we got higher, the winds picked up. Did I mention Greyhound and I refused to check our backpacks at the ranger station? We were carrying full loads up this steep mountain. I would have had it no other way. I carried my pack every step of the way from Springer on – why stop now? We cleared The Gateway at 10:15pm and got our first view of Baxter Peak, the northern terminus of the Appalachian Trail. Greyhound and I were giddy. In a few short hours we’d be thru-hikers. As the summit drew near, I started crying. I’d be reminiscing about a memorable hike or great day on the AT, and tears would just start rolling down my face. I thought about all of the people I had met along the way. I thought about Black Santa – I thought about Savage. At last, you could see it. The summit, and the approach leading up to the summit, was very crowded with day hikers. I was shaking in anticipation. At 11:29, I became a thru-hiker of the Appalachian Trail. Greyhound and I did it. I pulled out that stupid horseshoe I tripped over in Manchester Center, VT to commemorate the event. We sat behind a boulder on the summit for a while, talking and sporadically bursting into tears. I don’t have the words to describe how I felt – I hope someday I will. We slowly made our way down the mountain, joking the entire time that we were now hiking unofficial miles. Where was our gondola that took us to lobster dinners at the bottom? We made our way back to the ranger station at 3:30pm and signed the register indicating we were off the mountain. After catching a ride into Millinocket, ME and checking in at the A.T. Lodge, we showered and made our way to the best restaurant in town. We split a lobster dinner. We deserved it. Author Chris KummerPosted on October 26, 2016 Leave a comment on Day 153 – Tuesday, August 9th: The Birches Lean-to to Mount Katahdin, 5.2 miles, 2,189.1 total AT miles. Author Chris KummerPosted on October 26, 2016 Leave a comment on Day 152 – Monday, August 8th: Stealth Camp (Nesuntabunt Mountain) to The Birches Lean-to, 31.1 miles, 2,183.9 total AT miles. Author Chris KummerPosted on October 26, 2016 Leave a comment on Day 151 – Sunday, August 7th: Cooper Brook Falls Lean-to to Stealth Camp (Nesuntabunt Mountain), 23.4 miles, 2,152.8 total AT miles. Author Chris KummerPosted on October 26, 2016 Leave a comment on Day 150 – Saturday, August 6th: Stealth Camp (West Branch of the Pleasant River) to Cooper Brook Falls Lean-to, 24.5 miles, 2,129.4 total AT miles. I woke up and broke camp quickly. There were a lot of folks mulling about – we had been in the middle of a southbound thru-hiker bubble for a while now. I used the privy and gathered water from the stream that flowed alongside camp. We were on the trail just after 7:30am. Greyhound was apologetic about having to hike the next two miles again – I told her it was not worth worrying about. But I was a little worried – it was Day Two in the HMW and we were already ten miles behind schedule. The trail today was a little difficult. We were constantly hopping from rock-to-rock and root-to-root all morning. Around 10:30am, I found a giant, green caterpillar on the AT – it reminded me of the horn worms that used to attack my mom’s tomatoes when I was a kid. This thing was terrifying. It was thrashing back and forth, wiggling its blue horn into the air. What a monster. At around 1:00pm, we stopped at the Barren Ledges to have a quick lunch – I’m thankful I’ve become really good at eating – I can finally close my food bags! We set off with a renewed vigor and summit Fourth Mountain at 3:30 having traveled eleven miles on the day. We hung out on Monument Cliff for a while – today was turning into a great hiking day. 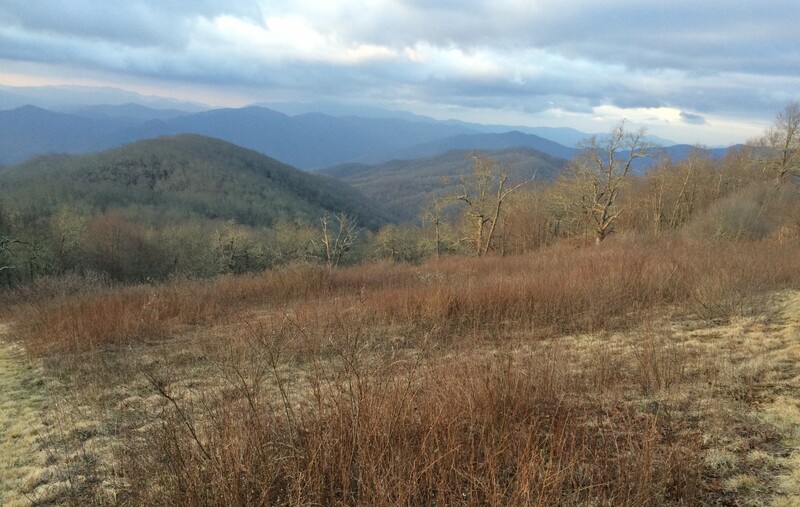 We hiked to the summits of Columbus and Chairback Mountains – Chairback was beautiful. We caught an amazing sunset as we descended into the valley below. It got dark quickly – we continued hiking north with headlamps. The trail stayed rocky – we found little options to camp. As we approached the banks of the Pleasant River, we started passing several clusters of tents – there wasn’t a campsite to be found. We eventually made it to the river. We decided it’d be best to ford this thing now, giving our shoes some time to dry out overnight, rather than tackle it first thing in the morning. The crossing was a cinch – it was only about calf-deep at the most. We set up camp directly on the AT on the opposite shore – it was nearly 10:30pm before we even started cooking dinner. We both went to sleep quickly. Author Chris KummerPosted on October 26, 2016 Leave a comment on Day 149 – Friday, August 5th: Wilson Valley Lean-to to Stealth Camp (West Branch of the Pleasant River), 19.9 miles, 2,104.9 total AT miles. Day 148 – Thursday, August 4th: the Lake Shore House (Monson, ME) to Wilson Valley Lean-to, 10.4 miles, 2,085.0 total AT miles. We woke early and immediately started packing. I took another quick shower and finished organizing my food bag, making sure I was carrying enough for at least six days of backpacking. We both suited up and left the hostel at 8:00am. We walked a block down the street and decided to have one last real meal at the town diner before heading out. The food was absolutely amazing – they even had a bakery that sold fresh-baked bread and an assortment of sweet snacks. I bought a small loaf as we were leaving. We strapped on our packs and headed across the street to try to get a hitch to the trailhead. In minutes, a USFS truck pulled over and offered us a lift. We climbed into the truck bed and took off. We arrived at the trailhead in minutes and officially entered the Hundred Mile Wilderness. We passed by several ponds and decided to take a break at Little Wilson Falls. It was a very cool. The couple who picked us up in Andover told us that the areas surrounding Monson were known for their slate. You could definitely see that was the case at Little Wilson Falls. We pressed on at 2:30pm. We weren’t hungry yet, but we were getting there. Maybe a mile or so past Little Wilson Falls, we decided to stop and have lunch. All of a sudden, the skies opened up. Thinking I was being clever, I pulled my footprint (ground cover) out of my tent bag – Greyhound and I held it over our heads like a giant poncho while the storm passed. It made eating our lunch awkward and difficult. But we stayed dry and were back on the trail at 3:15pm. I wish we could say we were making good time, but we weren’t. While the terrain was relatively flat, it was very rocky and rooty, and pretty muddy from all the rain. At 4:50, we stopped to ford the Big Wilson Stream. I stood on the bank and watched as Greyhound attempted to use an overhead rope to shimmy across the water’s surface. But the physics weren’t quite right. She jumped in the air to gain momentum – but gravity had other ideas. She ended up landing square in the middle of the stream, her legs and the bottom of her pack getting drenched. It was a sight to behold! Thankfully, she wasn’t injured (ego, for sure) and we quickly moved on. Did I mention I filmed the whole thing? Priceless. We hiked on, passing the Wilson Valley Lean-to at 4:00pm and continued hiking north. We had crossed a small mountain and were nearing a series of streams when Greyhound paused and yelled – her hand was holding her ear. Her earrings were gone! We tried to figure out what happened and when. She remembers feeling the rope pull past her ear when she jumped/fell into the stream hours ago – her earrings must have been ripped out then. It was the only plausible scenario we could come up with. And these earrings were special – they were given to her by her grandmother as a graduation present. She was very upset and disappointed to say the least. But we had still had many miles to hike if we wanted to stay on schedule. I told her the earrings were more important, that we should turn around and try to find them. I knew it might take some time to find them – it’d be sunset by the time we arrived back at the stream. I assured her it was worth losing miles in order to find them. We turned around and started sprinting back to the Big Wilson Stream. After an hour of hiking, we passed the Wilson Valley Lean-to. We had decided I would stay behind with our packs and make camp while Greyhound ran ahead to find her earring. I quickly put up my tent and stowed our packs before heading down trail to help her search. I was nearly to the stream when I saw her hiking north towards me. As she got closer, I saw that she had a big smile on her face. She found her earring! She said she spent a few minutes in the creek, moving rocks aside were she fell in. She moved a few feet to her left, looked down and saw something gold glinting the sunlight. She reached down and plucked it out from the sandy bottom – only the stud was exposed. How lucky – I was truly glad she found it! We hiked back to the lean-to and finished making camp. We had plenty of time to cook dinner and relax before going to bed. A group of teenagers from the Maine CCC (Civilian Conservation Corps) were camped all around us – they were doing trail maintenance on this section of the AT. It got a little noisy – I thought about the boy scouts. I also thought about Walk With Nature, my middle school backpacking club. While on our first backpacking trip to AT in North Georgia, I met a backpacker attempting his thru-hike. I remember his story well. The seed had been planted. Author Chris KummerPosted on October 26, 2016 Leave a comment on Day 148 – Thursday, August 4th: the Lake Shore House (Monson, ME) to Wilson Valley Lean-to, 10.4 miles, 2,085.0 total AT miles. Day 147 – Wednesday, August 3: Stealth Camp (West Branch of the Piscataquis River) to the Lake Shore House (Monson, ME), 12.0 miles, 2,074.6 total AT miles. We woke up early and packed quickly. We didn’t want any of the hikers we passed last to catch up with us before we broke camp. After a quick breakfast, we were on the trail by 6:30am. The trail into Monson was very rocky – and got rockier as we approached. The weather was nice at least – cool breezes and big, blue skies. We hoped to arrive in Monson by noon, but the trail had other plans. We finally spilled out into the trailhead parking lot at 1:30pm. I called the hostel and asked if we could catch a ride. We were picked up fifteen minutes later and found ourselves checking in shortly after that. We both took showers and got our clothes into the laundry. We put on loaner clothes and headed to Shaw’s, a different hostel in town that maintained a hiker resupply shop. Buying all those snacks and meals quickly added up – it was definitely one of my more expensive resupplies. Walked our purchases back to the hotel and put on clean clothes. It didn’t seem like there were many hikers staying at the Lake Shore – there were quite a few at Shaw’s. While Shaw’s had a small store and more of a community of hikers staying there, the Lake Shore had a restaurant on the first floor. We walked downstairs and sat at the bar. The food was nice – and not too expensive. I ordered crab rangoons, chicken wings and a sandwich and fries. We ate quickly and ferociously. I headed to the convenience store to grab a few more snacks before turning in for the night. We looked through the AT Guide at the elevation profiles for the days ahead. In order to summit Katahdin on the 9th, we needed to cross through the Hundred Mile Wilderness in five days – that’s about 20 miles a day. The profile looked awfully flat in places, especially towards the end. We were very confident we could do it. We went to bed ready to enter the last big section on the AT. We still haven’t seen a moose. Everyone else has seen one, if not many. This really bothers Greyhound – she wants her moose bad. I told her we’d definitely see one in the HMW. I hope I’m right. Author Chris KummerPosted on October 26, 2016 October 26, 2016 Leave a comment on Day 147 – Wednesday, August 3: Stealth Camp (West Branch of the Piscataquis River) to the Lake Shore House (Monson, ME), 12.0 miles, 2,074.6 total AT miles.